Those longing for the romance of Old World Europe will get to travel into the very heart of the continent, where empires were built, kings and queens were crowned and some of the world’s greatest music was composed and performed by the likes of Mozart and Beethoven. Grand European cities like Vienna, Bratislava and Budapest forever remain timeless. Admire the beauty of Austria’s Lake District and the Czech Republic’s charming mountain town, Ceský Krumlov. 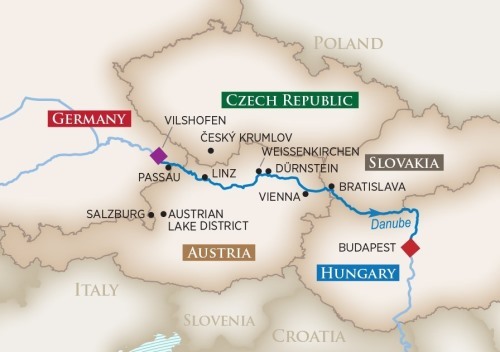 From grand abbeys and fortresses perched high above the Danube to plentiful iconic UNESCO World Heritage Sites, be romanced by the Danube with all her regal and romantic splendor.